Breakfast for dinner is the quickest way to get a meal on the table. These eggs cooked in tomato sauce are the perfect fit. Some nights you just need dinner fast. 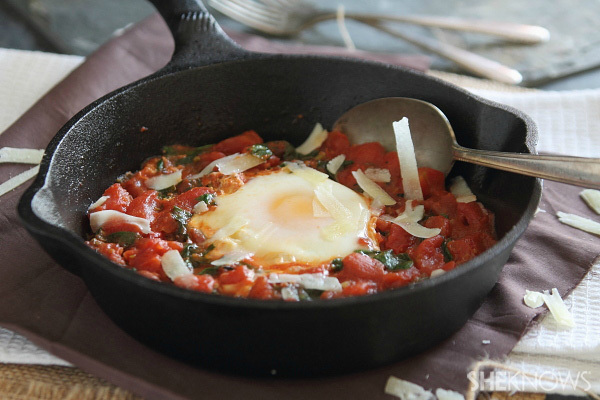 This spicy tomato egg skillet is the perfect solution. Make it for one on a night alone or easily adapt it for the entire family. Either way, dinner’s ready in 20 minutes, and you didn’t even have to defrost anything from the freezer. Add the garlic, red pepper flakes and thyme and cook for 1 minute. Add the diced tomatoes with the juices and season with salt and pepper. Stir to combine and let simmer on medium-low heat for about 5-7 minutes until the tomatoes cook down a bit. Stir in the baby spinach and let it wilt into the tomato mixture. Make an indention for the egg (or eggs if using more than one) with the back of a spoon and crack the egg into that spot. Let cook for about another 7-10 minutes until the whites are firm and the yolk is cooked to your preference. Top with the grated Parmesan cheese and serve immediately.